Mayor Daley welcomes the world's largest steel maker into Chicago with open arms. 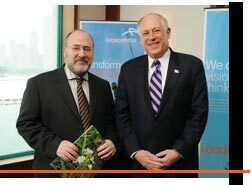 Louis Schorsch, left, CEO for flat carbon steel in the Americas, celebrates with Illinois Lt. Gov. Pat Quinn after the announcement of the ArcelorMittal Great Lakes Watershed Restoration Program at the Shedd Aquarium. Standing guard over the Daley Civic Plaza on Washington is a most intriguing if not peculiar creation. It is an untitled behemoth mongrel of sorts. Part dog, part bird. The 50-foot sculpture created for the city of Chicago as a gift from the great Pablo Picasso has become nothing less than a beloved city icon. Young skateboarders impress one another by doing tricks off of the sculpture's base while downtown professionals take lunch breaks on park benches nearby. The material Picasso chose for the 162-ton landmark is the same material that the Richard J. Daley Center behind it is constructed of - steel. Chicago's great skyscrapers, like the John Hancock Center and Sears Tower, were made possible by the same material - steel. Whether you are riding into the city on an Amtrak Train or getting from the 95th St./Dan Ryan station to Evanston on the El, you are riding the rails. Make that the steel rails. So, isn't it appropriate that the world's largest and most global steel company would pick the Windy City as its headquarters for the Americas? That's just what happened in 2005. 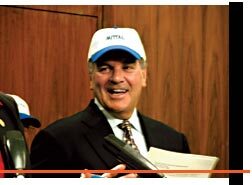 Mittal Steel officially hung its hat in Chicago, choosing the city as the best location to handle its U.S. business - then expanded its presence a year later when Mittal acquired the world's second-largest steelmaker and embraced it in a new name, ArcelorMittal. Why Chicago? Because the city has all of the key components to create an effective business climate including non-stop flights to every corner of the world, a strong corporate climate and excellent quality of life. ArcelorMittal's statistics are as impressive as the 2005 Chicago White Sox. More than 320,000 employees in 60 countries make up what is truly the world's only global steelmaker. In the Americas, operations are in Canada, Mexico, Trinidad, Brazil and Argentina as well as in 12 states of the United States. It also is the market leader with operations in Europe, Asia and Africa, and is growing in China and India. The company is the leader in all major markets, including automotive, construction, household appliances and packaging,with leading research and development and technology, as well as sizeable captive supplies of raw materials and distribution networks. The company ships more than 130 million tons of steel annually, generating well over $88 billion. ArcelorMittal shares are listed on the New York and several other stock exchanges. ArcelorMittal has grown exponentially over recent years through numerous acquisitions. Its success formula has not been to divide and conquer but to acquire and improve. Part of what has allowed for such growth is what ArcelorMittal calls the "Knowledge Management Program" which was designed to speed the flow of best practice and technique throughout the company. Global reach brings the benefits of sharing this know-how and generates product synergies. Scale brings purchasing power which allows companywide growth. Diverse and well-connected sales and marketing networks maximize communication. Through the company's consolidations, ArcelorMittal has been able to spread the best practice and techniques throughout its plants. ArcelorMittal's large global presence is important to today's increasingly global manufacturers. And the company's customer list includes the household names in the automotive, engineering, appliance and other sectors. Part of the company's charge in Chicago's Loop is the leading U.S. steel producer, ArcelorMittal USA, which makes steel from raw materials at plants in East Chicago and Burns Harbor, Indiana; Cleveland, Ohio; and Riverdale, Illinois. It creates new steel from scrap with electric furnaces at plants in Steelton, Pennsylvania; Georgetown, South Carolina; and Coatesville, Pennsylvania. Value-added plate markets are served from Coatesville and Conshohocken, Pennsylvania, as well as operations in Indiana. ArcelorMittal also has finishing facilities in Weirton, West Virginia; Hennepin, Illinois; Lackawanna, New York; Newton, North Carolina; and Columbus, Ohio. The company also leads the world in steel research and development, with scientists at a key laboratory campus in East Chicago, Indiana, providing much of the brain power. In addition to the automotive industry per se, ArcelorMittal is a major supplier to the broader transportation sector, with customers in the trucking, off-highway, agricultural equipment, and railway industries. It also has a strong customer base in the appliance, office furniture, electrical motors, packaging, industrial machinery, and other manufacturing sectors, as well as the distribution and service-center industry.